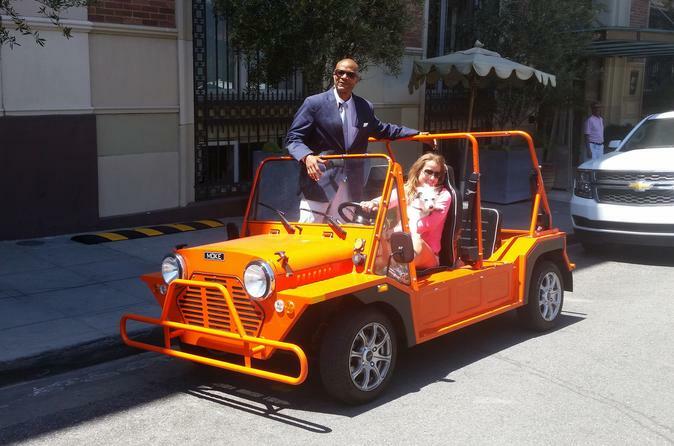 Have a blast cruising around the greater Hollywood area in a Moke custom electric car. This open-air vehicle will give you great views of the Sunset Strip and Beverly Hills or wherever you choose to visit. Also, you don't need to worry about filling up the gas tank after your self-guided tour because the car is electric. Whisk around L.A. in an all-new, brightly colored Moke electric vehicle, which seats up to four passengers. Explore all the sights around the greater Hollywood area, including Beverly Hills and the famed Sunset Strip. Families and couples alike love riding around in this retro style Moke vehicle. This exclusive offer will provide you with an exciting experience and let you take in all that L.A. has to offer in a unique electric car. There's nothing else quite like it. No gas to fill, its electric. Just get in and go. Rental period is for 3-hours.